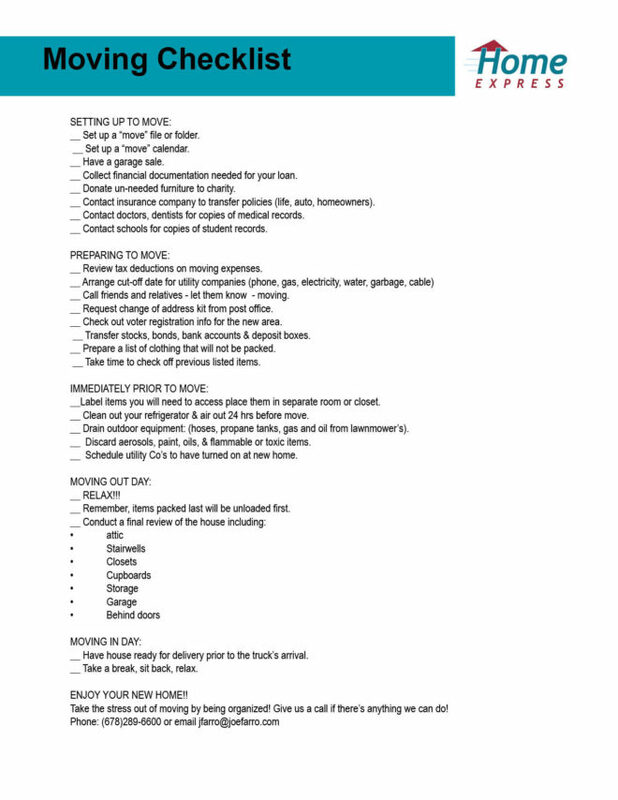 Preparing to move can be a daunting task, but follow the steps below or download our Moving Checklist and it might not seem as overwhelming. __ Set up a “move” file or folder. __ Set up a “move” calendar. __ Collect financial documentation needed for your loan. __ Call friends and relatives – let them know – moving. __ Check out voter registration info for the new area. __ Transfer stocks, bonds, bank accounts & deposit boxes. __ Prepare a list of clothing that will not be packed. __ Take time to check off previous listed items. __ Label items you will need to access place them in separate room or closet. __ Clean out your refrigerator & air out 24 hrs before move. __ Drain outdoor equipment: (hoses, propane tanks, gas and oil from lawnmower’s). __ Discard aerosols, paint, oils, & flammable or toxic items. __ Schedule utility Co’s to have turned on at new home. __ Have house ready for delivery prior to the truck’s arrival. __ Take a break, sit back, relax. ENJOY YOUR NEW HOME!! Take the stress out of moving by being organized! Give us a call if there’s anything we can do.